Earlier this year, The Centre for Research on Multinational Corporations (“SOMO”; a Dutch NGO) issued a report about an international mining company they said had avoided paying $232 million USD in taxes in Mongolia. The mine in question is the Oyu Tolgoi (OT) copper and gold mine and the company is Turquoise Hill, a Canadian company, 51 percent owned by the Australian mining giant Rio Tinto. The Oyu Tolgoi mine is considered a big deal in Mongolia and has been subject to lengthy negotiations on how to split the risks, costs, and profits of the project between the company and the government. While this question is of primary interest to the people of Mongolia, I think that delving into the detail of individual cases like this is also important for clarifying the broader debates and understanding of tax issues. SOMO say their report “reveals how Rio Tinto has managed to pressure the Mongolian Government into signing deals that are detrimental to its own interests” and in this way “been able to design and preserve a tax dodging scheme that has allowed it to persistently avoid substantial tax payments to Canada and Mongolia.” Oxfam uses it as an example of “how poor countries like Mongolia may be losing millions because of corporate tax practices and legal loopholes.” Turquoise Hill in response say that the report is inaccurate and misleading. They say the investment deal was openly agreed with the Government of Mongolia and that the company’s structure (which involves subsidiaries in the Netherlands and Luxembourg) does not reduce tax in Mongolia, and is in compliance with Canadian tax laws. States and companies may not be hiding anything of great import, but so long as contract disclosure is scattered and leaked materials suggest hidden horrors, that perception will persist—providing easy fodder for demagogues and politicians to make calls for expropriation and renegotiation in cases where it is not merited. All of the OT Investment agreements have been published and Turquoise Hill is covered by Canadia’s “ESTMA” revenue transparency regulations, while Rio Tinto produces an extensive “taxes paid” report. However, the Oyu Tolgoi case shows that just having these documents and data in the public domain may not be enough. It also matters what you do with them. Open Oil (a social enterprise that specializes in public interest financial modeling) points out that debates about these kinds of deals often fall into the trap of the single term dilemma: you can point to any one element and argue that it is too high or too low, but what really matters is the overall division of earnings over time; when will each party start to see a positive return from the project, and what will their revenues look like over the 50+ years of operation? Is that fair? And is the investment viable? The Oyu Tolgoi project is a massive, technically and operationally complex project. By the end of 2014 almost $7 billion had already been spent on developing it, and the total investment will be around $12 billion. The thing that complicates the fiscal side of the deal is that the government is getting a 34 percent “carried interest.” Turquoise Hill and its shareholders are covering 100 percent of the upfront exploration and development costs but will only end up owning a 66 percent share of the project, while the government will not put up any of the up-front investment but will end up with a 34 percent share (through the state-owned enterprise Erdenes). Open Oil has previously developed a model of Oyu Tolgoi’s finances and revenues. As it shows, Oyu Tolgoi delivers early revenues in the form of VAT, royalties, and customs and withholding taxes to the government—long before investors begin to receive dividends. Turquoise Hill say to date the project has paid out $1.7 billion in taxes and royalty payments and that the investor side will not commence to be cash flow positive until around 2026. Are reduced withholding taxes “shameless abuse”? SOMO’s belief that tax revenues to date should have been $230 million higher in Mongolia than they were, is based on the argument that the project ought to be paying a 20 percent withholding tax on cross-border interest on loans from the parent company (as is shown in the Open Oil base case) whereas in practice this has been reduced to lower levels. Withholding taxes are taxes on the gross value of cross border payments such as interest. They are simple for governments to collect (compared to profit taxes), and are an important safeguard against companies shifting profits from high tax to low tax jurisdictions. 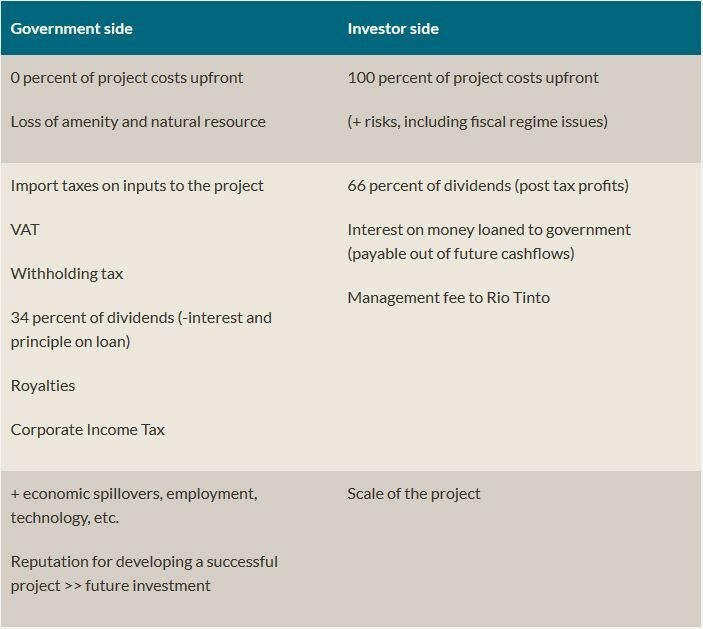 Even in the absence of profit shifting, withholding tax are relatively attractive for governments because they start to generate public revenue early in the life cycle of an investment, rather than waiting for the project to be in the black. However, a large tax on interest is like an import tariff on borrowing money; it raises the cost of capital. Therefore countries seeking inward investment often sign double tax treaties, which reduce withholding tax rates. SOMO argues that the 10 percent WHT rate is abusive because it was secured using a double tax treaty with the Netherlands, which Mongolia has since unilaterally cancelled. However as Turquoise Hill points out, had the loans come from directly from Canada the interest would have been subject to the same 10 percent tax rate. Similarly, if the loans had come from the UK, France or Germany the rate would also have been 10 percent. In fact, when the Investment Agreement was signed Mongolia had 30 double tax treaties and only four of them had a withholding tax rate on interest that was different from 10 percent (one higher and three lower). When the IMF undertook a review of Mongolia’s Tax Treaties it recommended that Mongolia adopt a standard WHT rate of 10 percent for interest. But their interpretation does not reflect the way that withholding taxes work in commercial practice. The cost of the tax has to be priced in and it typically raises the cost for the borrower, rather than lowering the return that a lender is willing to accept. In practical terms, interest rates are usually specified as “net of all taxes” with the borrower required to gross up the payment to cover any withholding tax. That means that if WHT was charged on Erdenes’ share of borrowing, it would be the government paying it to itself (by borrowing additional money from the project). This would bring forward revenues, but the value of the withholding tax would need to be taken off the value of dividends which might be received in later years, with added interest. While it seems like an exaggeration (or a misunderstanding) by SOMO to call these issues “abuse,” their report does highlight a question about whether the implications of the treatment of WHT for the overall deal were fully understood. This is perhaps even more important going forward than in assessing the taxes paid so far. Using Open Oil’s base case model the difference between a 20 percent or 6.6 percent withholding tax on interest could be worth around $1.3 billion over the life of the mine (undiscounted), while the difference between a 20 percent or a 0 percent dividend withholding tax (as secured by the Netherlands treaty) is worth around $3.7 billion. Turquoise Hill argue that it was always clear that the equity investor was a Dutch entity, and would therefore use the Dutch tax treaty. We cannot simply assume, as SOMO do that the project would be viable (or that there would not have needed to be concessions in other areas of the deal) if loans were subject to an additional 13.4 percentage points of withholding tax on interest (as well as a 26 percent tax on the interest received in Canada as SOMO also argue). While it seems unlikely that the negotiators on either side would simply have left the question of withholding tax rates unsettled, what is not clear whether the implications for project’s revenues were clearly understood and communicated across the government and to wider stakeholders. The fact that neither the IMF nor Open Oil’s models of the project seems to correctly reflect the Netherlands tax treaty suggests that the implication of tax treaties were not widely obvious even to careful observers. Turquoise Hill and the Mongolian tax authority have also had large differences of opinion about how much tax is due from the company. In 2014 a bill was issued for $127 million USD for unpaid taxes from 2010 to 2013, which was subsequently cut by more than 75 percent on appeal. Turquoise Hill is currently in dispute with the Mongolian revenue authority over whether their outstanding taxes for 2013 to 2015 are $5 million or $155 million (it has been suggested by industry analysts that this also relates to withholding taxes). Could contract transparency be better? Natural resource contracts are increasingly put into the public domain. But as this case highlights, making sense of the numbers and the legal documents is not straightforward and deals remain open to claims of abuse and loopholes, which may not necessarily be well founded. The World Bank, NRGI, and the Columbia Center on Sustainable Investment have sought to bridge the knowledge gap with the ResourceContracts.org database which annotates contracts to make them easier to find and understand. NRGI provides training and support to civil society organisation and parliamentarians in analysing contracts (including in Mongolia). 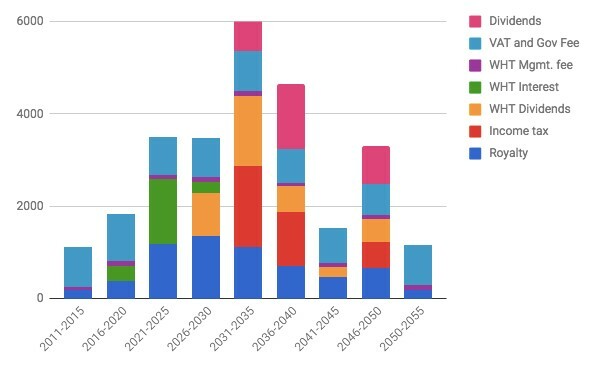 Open Oil develops open source fiscal models of oil, gas and mining projects. However, contract terms alone don’t tell the full story, and are easy to misinterpret. 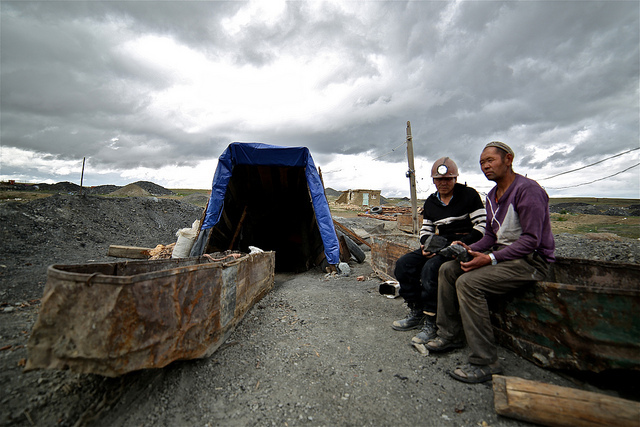 Ali Readhead and David Mihalyi argue that it would be beneficial if the Government of Mongolia and Turquoise Hill produced a joint communique on which WHT rates apply for the shareholder loan, the project finance loan, and future dividends. More generally, perhaps what might be helpful would be to develop open public “term sheets” for oil, gas, and mining contracts which set out the basic variables contained in contracts and the relevant laws and treaties needed to develop a fiscal model. This would provide a crucial link between open contracts and fiscal models, and by using a standard template might be able to make clear whether each party, and the public have adequate information to judge the deal. Companies and governments could support public understanding by providing such information proactively, alongside publishing the detailed contracts. If transparency about contract terms matters, then so too does the way that this information gets interpreted and shaped into stories. The SOMO report was developed according the organisation’s own quality standards: a draft was sent to Rio Tinto two days before Christmas and the final report published at the end of January, giving little time to engage with the company’s response. A single unnamed “fiscal practitioner” was consulted as peer reviewer. It is not clear whether this person had good knowledge of project finance, but it seems unlikely. Oxfam judged this to be good enough to take the story at face value, without a second opinion, and amplified it to a broader audience. I don’t think those quality standards are adequate if what we want is serious and credible analysis. Getting better depends on consumers demanding better. The consumers in this case are the community of people who think that it is worth reading, writing and funding (and quoting, retweeting, remembering, and using…) public analysis about the extractive sector and public revenues (if you got to the bottom this blog post you are part of this club). Accepting lower standards of analysis and review means giving up on trying to tell a real scandal from a sensational headline. With thanks to Rhodante Ahlers and Vincent Kiezebrink, Ross Lyons, Ali Readhead, David Mihalyi, Dan Neidle, Alistair Watson, and Paddy Carter for thoughts and comments. 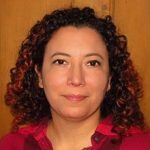 First published on the Center for Global Development blog on Tuesday 3 April 2018.